I’m sitting at my desk. Today is the day that I’m supposed to work on my blog and put together my email newsletter. But my eyes keep on filling with tears and all I can think about is the precious little black cat with the white tummy and paws (one with a perfect imprint of a black heart) that my Mom and I said goodbye to late last night at the animal emergency hospital. I really don’t feel like writing. I really don’t feel like sitting at the computer. So I stop and I walk away. That little gnawing voice inside of my head is telling me that I should put my content first and that I owe my list a newsletter? The truth of the matter is that things like this are always cropping up to interfere with my blog posting intentions. Whether it’s one (or several) sudden urgent demands from clients out of nowhere. Or a really heavy workload. Or a nasty bout of the flu. Or just a bad day. I’m not always in a position of being able to send out my email newsletter the same day at the same time on a regular schedule. And I’ve made peace with that. Which is why I have never put a schedule on myself. The emails will come out bi-weeklyish (emphasis on the “ish”) and that’s that. Any small business owner engaged in email marketing is anxiously thinking – how often should I send? And when should I send? And should it always be the same? 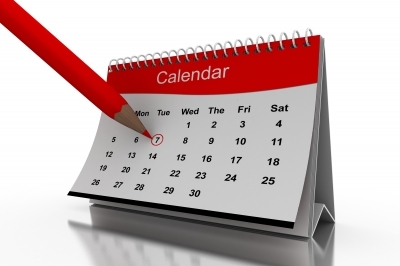 Do you need a set content schedule? There are basically 2 camps – those that stick to a strict schedule and those that don’t. Let’s look at what’s going on at either camp. Two small business bloggers that I love to follow are Karen Gunton from build a little biz and Pamela Wilson from Big Brand System. These 2 impressive gals are always sticking to their email newsletter schedule. Every Saturday, on the button. And I’ve often wanted to emulate that. I know Karen has mentioned how she gets the feedback that her people look forward to the emails, and reading her newsletter is part of a weekend routine with a cup of coffee. I like that. A part of me really wants that consistency and admires those that pull it off, week after week. These are the others who just send when the content is done and the inspiration has struck. They throw optimization out the window – what is the best time to send out an email newsletter (or blog post if you do the whole emails via blog posts thing)? Who cares, I wanna send it now. My readers will get to it when they open their email, whenever that might be. If they really love my content, they won’t care when or how often I send it. Sure, I could stay up until midnight on those crazy days and just force myself to get it done right now because that’s what I feel I should do. But that really isn’t my style. I’m more of a go with the flow kind of a person. If I have people on my list that don’t like that I don’t have a set schedule, then I guess they are just not the right fit for me. They’re not my right people. And I think that’s true for everyone. Everyone has different preferences. I’ve had someone unsubscribe from my list because I sent out emails too often (she was kind enough to send me this feedback which I really appreciated). And here I was thinking that I didn’t send out nearly often enough when I was comparing myself to others. So don’t try to drive yourself crazy trying to please everyone. Or get yourself in a tizzy over the advice you read from an internet marketer insisting on or lauding the praises of consistent, frequent schedules, whether for blog posts or emails newsletters. It all comes down to what works for you. OK, but is there a set day and time I should stick to for optimal success? I know that you would really love it if I could tell you that if you send your email out every week on Tuesday at 9am EST you will get the best clicks and engagement. Wouldn’t that make it so easy? But as we all know, email marketing (and internet marketing in general) is never that easy. There have been studies done and there are graphs galore on the optimal time to send out blogs, but really it all depends. It depends on your industry. It depends on your audience. It depends on your content. It depends on how many time zones you blast out to. It just depends. If you use email marketing software for your mailouts (my fav is AWeber) there are plenty of tools at your disposal for tracking things like clicks and opens. Absolutely track and test and try different things if that’s your bag. I read this article on Copyblogger about the best time to send out emails. The author Linda (from the renegade writer) discussed that sending out on a Sunday is the supposedly the worst day ever, but she got great results in doing so. So really, the best option for success is unknown. You will have to be the master of your own experiment. But maybe you shouldn’t take it too far? One word of caution. If you’re collecting emails, you’re setting expectations that you’re going to be sending out emails. As much as I’m about go with the flow, I do think that some modicum of consistency is important. I know that I have been on lists where I didn’t hear anything for months or even years… and then in some cases would suddenly get a whole barrage of emails trying to sell me stuff. A bad case of the greedy email collector if you ask me. A few words come to mind: random, unprofessional and in some cases downright annoying (but that’s just me). My rule of thumb? Do unto others as you would do unto yourself. One piece of advice that I do have for you small business owners is to keep expectations and communications clear. If you don’t think you can keep to a weekly schedule, then you shouldn’t say that mailouts will be forthcoming weekly. And if you’re new to this whole email marketing or blogging thing and you’re not sure how it’s all going to pan out for you, maybe stay away from committing to a specific timeframe until you’ve figured out what works best for you. I know this is a pretty contentious issue and there are lots of differing opinions. I would really love to hear yours. How do you handle your email and blogging frequency? Do you always send out the same day and same time? In receiving emails, what are your preferences? Great post and analysis, Martina. I agree, there are two camps and both have good points. I know Chris Brogan’s newsletter goes out every Sunday and he swears that Sundays is the best day. Mine goes out bi-monthly, every other week, so no set schedule either 😉 Life just intervenes sometimes, right? This is an important consideration for small business owners in all aspects of their operations. If you are trying to find customers and clients who like you for who you are, that means liking your style too. Thanks for sharing your post with the BizSugar community. Thanks for popping by Heather!